Did you know that soy isn’t the health food it’s been made out to be? Sadly, I've heard many stories of how seriously soy can wreck your health. The soybean was a modest and unpopular crop until food manufacturers intent on creating cheap vegetable oils convinced the U.S. government to start subsidizing it. The soy was turned into oil, and the industry was left with an industrial waste product. Then somebody had a brilliant idea: Let’s take this industrial waste product full of toxins and carcinogens — isolated soy protein — and turn it into food that people will eat! Soy will destroy your thyroid. Many foods are goitrogenic (thyroid suppressing), but soy is king of them all. Goitrogens work by preventing your thyroid from getting the necessary amount of iodine. Friends, I believe this is what happened to Oprah’s thyroid. She pushed soy for years, featured it in everyone one of her “healthy” diets, and it destroyed her thyroid. If your thyroid fails, what happens? You gain weight. You have a harder time regulating your moods. You get colder more easily. You’re more easily fatigued. You demonstrate an inability to concentrate and remember details. The list goes on. You simply don’t want to mess with your thyroid. Soy foods aren’t real food. They aren’t traditional. They aren’t old. They’re industrial waste products dressed up in pretty clothes and marketed to an ignorant public. Read Is Edamame Good for You? Try a Real Food protein shake to avoid powdered soy protein shakes. Soy myths and truths brochure. “We've received a number of letters over the years from readers who have come to realize that their health problems stemmed from soy.” Read those letters here. I heard something interesting about soy this morning. A talk show host on the radio was talking about fitness & nutrition so I called in to talk about all the cream being ultra pasteurized. In the conversation the host mentioned drinking a protein shake. I told him to be careful because most protein shakes are made with soy & that soy is bad. After I got off the co-host said she didn’t know soy was bad for us & the guest speaker (I didn’t catch who he was) backed it up. He said if ground is contaminated (didn’t say what kind of contamination) you can plant soy & it will remove the contamination from the ground. If this is true, that is even more reason not to eat soy – what kind of contaminants has it absorbed from the soil it grew in? Good for you for calling in! Thank you for this information. I never realized how many items I commonly buy contain soy. I have always struggled with Polycystic Ovaries and wonder if the “estrogen like” properties of soy have exacerbated the problem. I am going to try to remove the soy and see what happens. Thank you! Lysander, you seem to have a few facts mixed up – I wonder, have you had a chance to take a look at any of the links above in the post? Were you eating straight-out soy products? Or was it the insidious stuff in all the processed foods only? We don’t eat any obvious soy products but I know it has to be in a lot of the processed things that find their way into our house. ‘Just wondering where you started from and where you went to for that great change in your health! no significant crop subsidies, as there’s no need for them, as U.S. farmers have no problem selling as much as they can produce and at a decent profit. those “toxins and carcinogens” in their tofu processed from U.S. grain exports? “dangers of soy” and you’ll find the source of the misinformation. selecting what to put in your body. discovered,most of the universitys are very evasive with their comments,i have now involved my husband in the research,and we will let you know our findings. Kelly you are a mind-reader. Just a few days ago, I told my best friend that soy was bad for you. I said it matter-of-factly. He said ‘why?’ and I mumbled something about it not being traditional and about how even the chinese ate only a little, and they fermented theirs. But I think I didn’t sound very convincing. Many traditionally fermented soy products aren’t fermented anymore, so check the label carefully. My sister drinks a soy shake everyday. She already has a tendency toward hormonal problems. But now that she is postmenopausal she doesn’t think there is anything to worry about with soy. I’m gathering research for her on the other problems soy causes. Thanks, Kelly, for more ammo. Jen, thanks! I will check it out. Diana, here are a few wonderful links for miso recipes from the company I purchase mine from. Enjoy! Tempeh is also a fermented soy product. Good follow up – thanks Kelly, Soli and Julie. I recently bought some miso, but am not sure what to do with it! Miso is a good soy product–it’s aged for months and months. Sally gives it a thumbs up, along with Tamari, which is aged soy sauce. I think these are about the only good soy products. From what I recall, and I admit I haven’t done nearly enough research, I think fermented soy is actually OK. I know I’ve seen miso and traditionally produced soy sauce as an ingredient in TF. Edamame, I don’t know, and I hope someone can shed some light. *Edamame isn’t fermented, so probably not good. *I think Miso is fermented (?). *I use a fermented soy sauce. Hi Kelly. I’m sure it is in one of these posts, but can’t find it readily: what about edamame, miso and soy sauce? Thanks in advance. Are you familiar with Kaayla Daniel, PhD? She’s an nutritionist/ author that writes for the Weston A. Price Foundation on the dangers of soy. 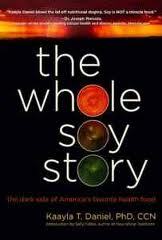 Her book is called ‘The Whole Soy Story — the Dark Side of America’s Favorite Health Food’. I’d been searching my local area for sources of natural food and information when someone lent me some copies of the Weston A. Price Foundation publication. In one of these I found an article she’d written that talked about soy in baby formula. That’s when it clicked that my traditional midwife had me on protein shakes to bring my protein up to 100 gm/day when I was pregnant (I tried to eat that much but drank the shake when I couldn’t). After contacting her, she conceded that the protein probably WAS soy — we’re not really sure but it was really prevalent at the time. My son is now 13, just getting into puberty when some of that stuff can show up. Fortunately most things seem on track but there are some definite concerns, too. She consults and helps you figure out nutrition and detox from any heavy metals with supplements using hair analysis to find out what you may have too much of and what you’re detoxing. We’re hoping to get started with her soon. She is not an MD, however, so if there are any hormone imbalances beyond that, an endocrinologist (she mentioned a reproductive endocrinologist, if I remember correctly) would be in order. Here is a link to her website: https://www.wholesoystory.com/. I was just surprised not to see her name come up anywhere since the Weston A. Price Foundation was involved. Thanks, again, for all your research and sharing, Kelly! I really appreciate your work! The part that worries me most is delayed or retarded sexual development in boys.Any suggestion on how to rectify this.